There was a brilliant response to my recent Vichy competition (you can read my review here) and I am delighted to announce that the following 5 people have all won a tube of the fabulous Vichy Normaderm Anti-Age moisturising cream. Drop me a line at fluff and fripperies at gmail dot com with your postal address and I’ll arrange to have your prize sent out to you. Thanks so much to everyone who entered and don’t be too sad if you didn’t win, because there will be lots more giveaways coming up in the future when I hit certain milestones with the blog - so spread the word. And make sure you've entered this lovely NUXE one, which closes on Friday - good luck! Yep, congrats all! Please send me your addresses asap and I'll get your prize out to you quicksharp! 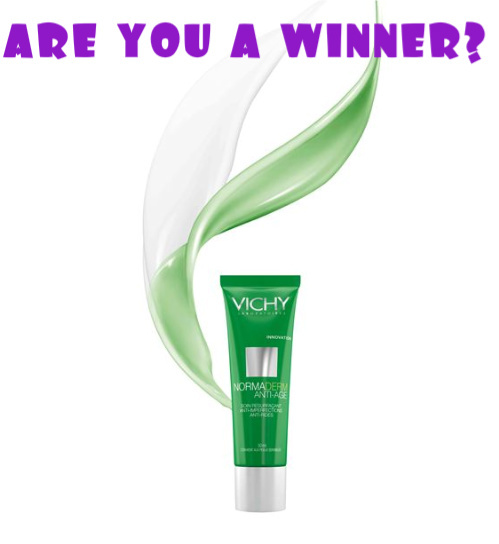 Congratulations to the winners of this aging cream but always remember that aging is a wonderful process.